Blending is a process to blend multiple feedstocks or mix in additives to a product to achieve special properties or simply homogenize the material. Ancos’ blending capabilities support finishing a polymer with an additive, whether liquid, powder or master batch and upgrading off-spec or second quality material. Ancos offers blending services to the plastics and chemical industries. Ancos delivers precision, close-tolerance blends using tumble vessels with stainless steel liners in batch sizes ranging from 85 lbs. to 42,000 lbs. In addition to double cone blenders, we also have ribbon and plough-type blenders for more demanding blends. The scale of our blending assets, with the ability to handle a full truckload of polymer in one batch and receive shipments via railcar, semi or tanker truck, enables us to achieve high quality and cost effective blending campaigns for our customers. The scale makes blending a viable alternative and lower cost option to compounding, selling off grade product or other services. As with all of our services, our equipment is engineered for complete clean down, minimizing cross contamination risk. Ancos has extensive blending experience, with blending being a core part of Ancos business since it was started as a polymer handling business over 40 years ago. Ancos experience and capabilities cover almost all forms of polymer blending including various plastic and chemical applications. We are able to handle virtually any polymer material in any form – pellets, flake or powder, any batch size up to a full truckload, and almost any inbound or outbound packaging type. Ancos’ focus on polymers gives us a deep understanding of the materials we blend. Our polymer focused development team includes PhD expertise to support any trial or R&D work related to blending. This expertise combined with the scale of our assets and complete flexibility on specifications and packaging, make Ancos ideally suited to provide your blending needs. Ancos has a full set of assets to support our plastic and chemical blending capabilities. All of our assets are stainless steel vessels with the ability to run under nitrogen. Our vessels also vary in size from small pilot scale up to a full truckload batch size. We have double cone, ribbon or helix and plough blenders available depending on the size and specification of a particular project. We are able to support batch sizes ranging from 85lbs to 42,000 lbs. Ancos plastics and chemical blending capabilities support a wide variety of customer needs. Whether it is creating master batches, blending master batches into final product, blending additives of all kinds into a product, or recovering out of specification product, Ancos blending can support your requirements. Ancos offers a full suite of polymer enhancement and material handling processes, many of which are complementary to blending. Depending on your specific needs, we are able to re-package, bag, de-metalize, dry, and cryogenically grind material after a blend is complete. In addition, we have the unique capability to dry and blend material in one step for certain materials, which can be an efficient and cost effective option for drying and blending. Ancos has the ability to support blending projects with analytical testing as needed for customers. With blending projects, we can test for moisture, bulk density and color of the product before and/or after a blend is complete. Toll blending can often be a low cost way for our customers to create value or meet product specifications. There are many benefits of blending, which vary widely across different types of blending. Precision percentage blending – Ancos is able to add numerous different input additives or ingredients to create a blend with highly specific desired end mixture percentages. This enables customers to add liquid, powder or other pellet additives. 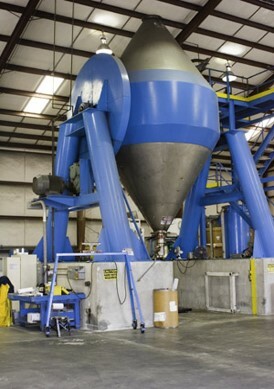 Our large scale blender can also process up to 42,000 lbs in a single batch, ensuring highly accurate mix results. Master batch blending – Toll blending can be a low cost but equally effective option for creating master batches when compared to compounding or thermal extrusion. Ancos can combine multiple ingredients into one batch while also eliminating additional heat history on the product. This allows for not only a cost competitive option, but also a higher quality option that maintains the integrity of color and clarity of the product. Salt and pepper blending / adding color concentrates – Blending is a cost effective alternative to compounding for adding color concentrates to a product. Additionally, many customers find that toll blending for color enables them to significantly improve inventory efficiency, as you only have to hold color concentrates and base feedstock in inventory as opposed to full supplies of multiple product colors. Viscosity blending – Blending is an option for our customers to alter the viscosity of a product without adding further heat history. We can blend high or low viscosity products together to achieve a desired end viscosity. This often allows customers to upgrade what might otherwise be off grade or out of spec product, and realize the full value of the material. Blending to change moisture level – Depending on product specifications, Ancos can often use blending to help customers recover product that is off grade due to moisture. We can blend high or low moisture product together to achieve an average moisture that meets your desired specifications. Homogenize – Ancos can help you blend large volumes of product to ensure a full batch is equally homogeneous. Our large blending assets enable us to run full truckload volumes and guarantee uniformity across the entire batch. Upgrade recycled product – Blending can be a cost effective and efficient way to mix recycled product with virgin material to achieve a desired specification. For customers that have requirements that enable a portion of the product to be recycled material, blending can create a lot of value. Additives to a blend – Ancos full blending capabilities are able to support all types of additives – from lubricants, antioxidants and slip additives to anti-blockers or oils. Ancos can also add oil and/or powder to cover a pellet if needed to meet your requirements. Cold compounding – By using a plough mixer that has variable speeds and variable temperature, Ancos is able to achieve compounding results for certain products. By adding solids, liquids and/or powder additives at different stages, different temperatures and different speeds, heated blending can be a lower cost substitute for compounding. Ancos is able to blend almost all polymers. A list of polymers we have handled before is below, but if you are working with a resin not on the list, please do not hesitate to reach out. We likely can support any of your needs. Quality is a top priority at Ancos and we are ISO 9001:2008 certified. We view ourselves as an extension of our customers supply chain and expect to deliver a level of quality and service you would expect from your internal operations. As such, we do full food grade clean downs between all products and have all stainless steel vessels. We are able to control for moisture gain during the blending process and utilize nitrogen blankets to support the moisture and color integrity of the products we blend.